Exit intent popups are game changers within the e-commerce industry these days. The reason is simple, this tool gives you the opportunity to recruit users that are just browsing your website and drive them to specific conversion actions. These actions can be transformed into extra revenue and additional subscribers for your e-commerce shop. By increasing the conversion rates simply means that you don’t have to invest more money in attracting more visitors to your site but rather make the best out of your existing customer base. Exit Intent Marketing is a subcategory of Marketing which focused on converting the website visitors which show the intent of exiting your website, into leads. Right now out of every 100 website visitors only 2 or 3 convert into customers, on average. This means that you probably miss 97% of your traffic. Even if you have a list building popup there is still room to optimize every part of your visitor’s journey. Designing and implementing a marketing strategy with exit intent popups, cart or browse abandonment mechanisms and remarketing ads, are all included in eCommerce best practices 101 nowadays. This is what Exit Intent Marketing is all about. Actually, how does this exit intent tool work? 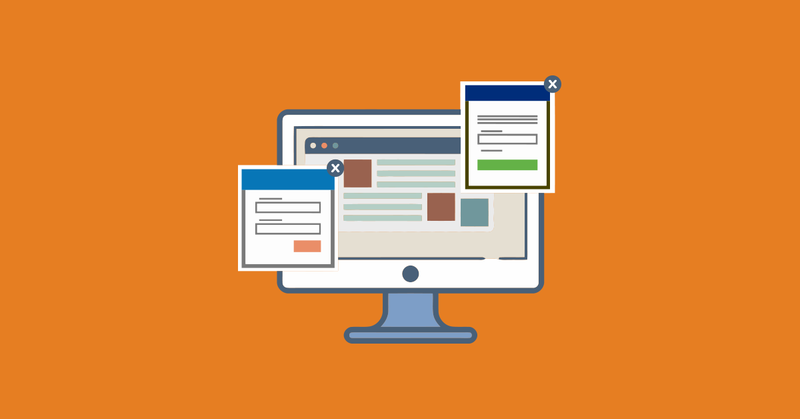 An email sign-up form, a classic pop-up or offer appears when the visitor shows signs of leaving the page. The algorithm detects user behaviors such as rapid mouse movements towards the back button, mouse freezing or specific user’s pathways. Now, it’s time for action! You should start creating the design and what you would like to gain from your exit-intent popups. If you are already using ContactPigeon, you can easily create your pop-ups without any knowledge of Photoshop or CSS by just using our new Dynamic Pop Up Editor. The copy must be straightforward. Clearly indicate the significance this email sign-up form is offering i.e. discount, subscription etc. Don’t ask them to fill in too much information. Have the minimum number of form fields and remember that the decision to fill in the form is impulsive, so make it as easy as possible. Always have a Call to Action button that stands out. Use copy that’s joyful and always test what works so switch it up! Another tool or does it truly make a difference to your e-commerce site? The ugly truth is that 68% of e-shop visitors leave your website without completing a purchase. By using dynamic pop-ups you can draw customers so you don’t have to invest in expensive customer acquisition campaigns. As an extra initiative, you increase the number of contacts in your database which is a huge asset as you can nurture contacts with an appropriate email marketing strategy and convert them to loyal customers. This can drive immediate sales to your e-shop. After all, visitors that added products to their carts and landed to the checkout page are the most likely to convert to customers. Giving them a discount coupon as an incentive to complete their orders is the simplest way to persuade visitors. Ecommerce platforms like BigCommerce or Shopify have built-in coupons such as percentage discounts, dollar-off discounts, product bundling, shipping discounts, or promotions like buy one, get one free etc. You can seamlessly integrate this coupon to an exit intent pop up by using a Marketing Automation platform like ContactPigeon and create a sales recovery machine! This is another great tactic for your e-commerce business. Create an exit intent popup that will communicate flash sales or extra points in your loyalty scheme for each purchase. This will increase the chances of a second-chance sale. Special offers are great but, keep in mind not to overly use this option because this does not build life-long clients. Probably the most common practice among e-commerce sites. It’s the perfect chance to convert unknown visitors to contacts and establish a relationship with them. You can have this popup appearing immediately when a user starts navigating in your site. Also, by giving them a clarity on why they should sign-up to your website helps you increase the possibilities of converting visitors while at the same time you may generate immediate sales. Who hasn’t experienced the scenario of you happily adding a product at the lowest price only to find out that you didn’t calculate the hefty shipping costs. Apparently, not estimated shipping costs is one of the main reasons for abandoned baskets. Having a free shipping offer promoted with an exit intent pop up is a useful tool to tackle cart abandonment and recover sales. Having a free shipping offer promoted with an exit intent pop up is a useful tool to tackle cart abandonment and recover sales in one. The check-out process can be a hassle even for the most sophisticated users out there especially when they have to fill out overbearing forms with shipping and billing information. Try to use an exit intent popup that will ask users if they need Customer Support in assisting them in this process. This has been a proven tactic in reducing significantly a number of people who abandon their basket. Let’s be honest. Having an infinite number of popups can seriously damage your user’s experience on your website and at the end of the day, no one likes to be interrupted when browsing products or reading an interesting blog post. In an effort to increase sales or generate more email subscriptions, marketers tend to forget the importance of customer satisfaction and a smooth user experience. In our digital world, the key to success is to focus on your strategy and always strive for improving the experience for your user. You’ll be amazed how powerful a pop-up tool is in converting all your visitors into revenue and, most importantly, lifetime customers!